I've got some exciting news! Today, I arrived to St. Petersburg in Russia, which is easily one of my favourite cities in the whole world. I fell in love with St. Petersburg two years ago, when I spent two weeks studying Russian at Liden & Denz. This time, I'm here for five weeks as an intern - I'm going to attend classes every morning and write posts for Liden & Denz blog in the afternoon. I get evenings and weekends off, so I'll still have plenty of time to explore the city. In the meantime, these are my top 5 recommendations for everyone visiting St. Petersburg for the first time - and I promise I'll be back with some more! The Peter and Paul Fortress, located on Zayachy (Hare) Island, saw the very beginnings of what’s now the second largest city in Russia. The fortress was originally built to protect the empire from Swedes, but it was also used as a prison – in fact, the famous writers Dostoyevsky and Gorky were both incarcerated here. Nowadays, Zayachy Island is a popular spot for tourists and locals alike. You can visit one of the museums inside the fortress’ walls or pay a tribute to the members of the tsar family, who were buried in the crypt of Peter and Paul Cathedral. 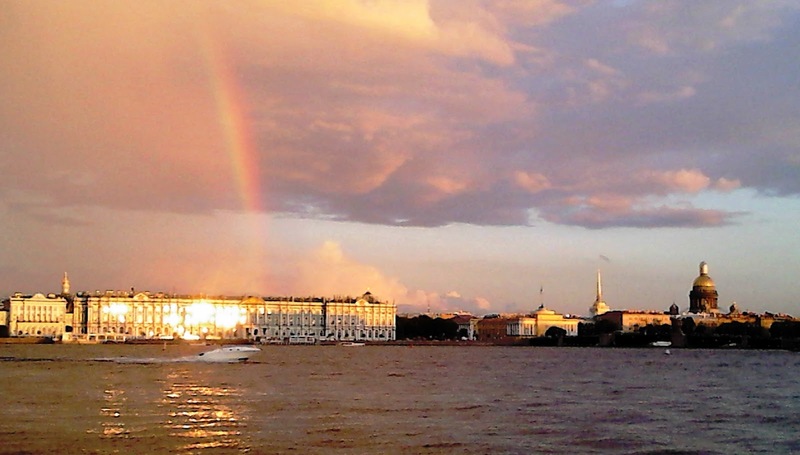 In the summer, you can sunbathe on the beach surrounding the fortress and then watch the sunset over the beautiful buildings of St. Petersburg. 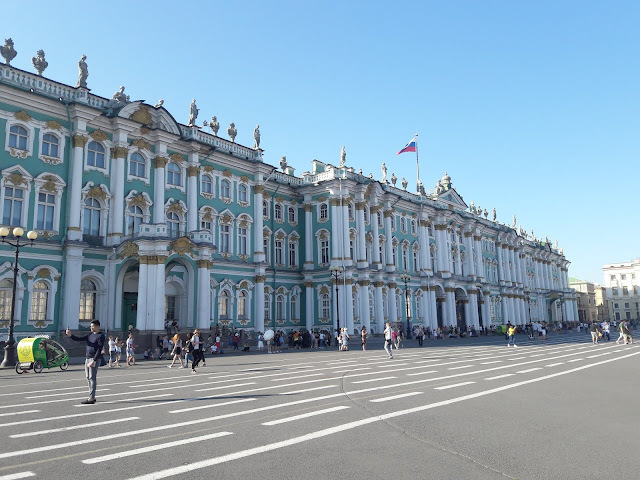 The State Hermitage Museum is the second largest art museum in the world, so it’s only logical that there’s not one, but six buildings housing its collection. The absolute highlight is the Winter Palace, the former residence of the tsar family. This beautiful building on the Palace Square is well-known not only for its grand staircase and throne room, but also for paintings by the likes of Rembrandt and Da Vinci. If you’re a fan of impressionism, I highly recommend a visit to the General Staff Building right opposite the Winter Palace. Here, you will find pieces from the 19th and 20th century (including a certain Mr. Picasso) as well as exhibitions of contemporary art. A stroll down the almost 5-kilometre long boulevard can be more stressful than relaxing during peak hours, but it’s definitely worth it. This busy street is the heart of St. Petersburg, pulsating with life day and night. You can sit on the terrace at one of the many restaurants and cafés and watch the buzz of the city, but if you’d rather go shopping, there are plenty of opportunities. My favourite shop on Nevsky is “House of Books” (Dom Knigi), a bookshop located in the beautiful Singer House. This building in Art Nouveau style was originally designed for the Singer sewing machine company. Nowadays, you will find hundreds of books on a variety of subjects spread across its three floors. Saint Isaac’s Cathedral is one of St. Petersburg’s most prominent landmarks. Couples take photos on the lawn in front of the cathedral on their wedding day and masses are still held inside, even though the church is usually bursting with tourists. If you join them, you’ll get the chance to admire the lavishly decorated interior as well as the breath-taking view of the city from the cathedral’s dome. Peterhof, also called the “Russian Versailles”, used to be the residence of Peter the Great. Surprisingly, the palace itself – though magnificent – is not as interesting as its surroundings. If you go for a good long walk in the gardens, you’ll see fountains of all sorts, including the Grand Cascade and the Samson Fountain with a huge golden statue of Samson fighting a lion. And when you wander just a little further, you will find yourself practically by the Baltic Sea with an amazing view of the Gulf of Finland. The best (and most stylish) way to get to Peterhof is definitely by hydrofoil on the river Neva. More posts from Russia (with love) coming soon!